One of ACKS' default assumptions, which I've commented on before, is that of the "failing empire", with barbarians at the borders and corruption within. Another of ACKS' standard assumptions it the inland sea, typically modeled after the Mediterranean in Antiquity. 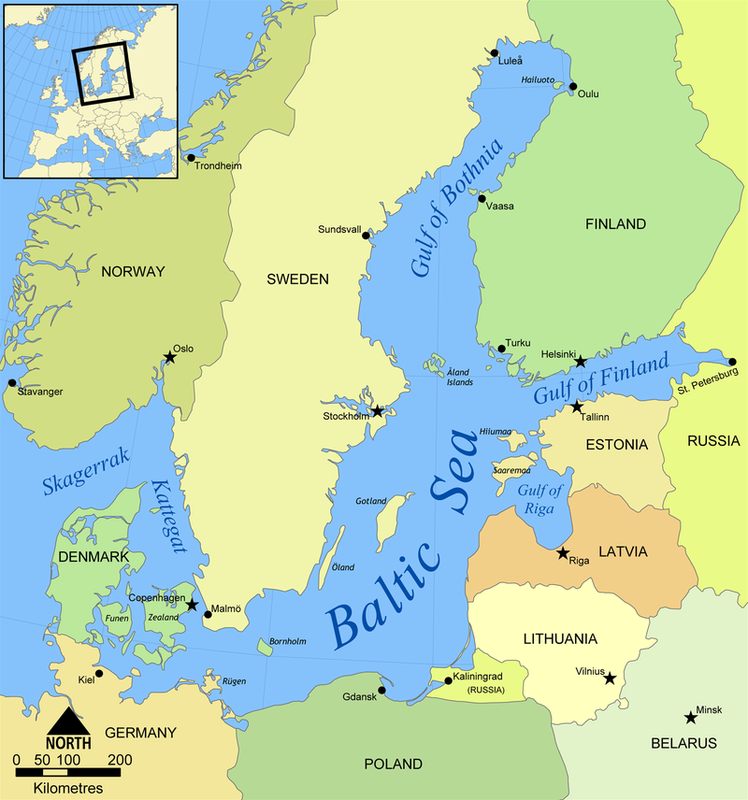 But there's another perfectly good inland sea in Europe that gets a lot less attention: the Baltic. Which, it turns out, is probably a fine model area-of-operations for a DaneACKS campaign. Much more so than the North Sea, with its super-long travel distances and terrible weather. The water-area of the Baltic is about 330 24-mile hexes, which is about a quarter of a 30x40 24-mile hex mapsheet, leaving plenty of room for surrounding lands. One problem(?) with the Baltic as an ACKS setting is that Scandinavia and environs are, historically, not particularly well-populated. At all. In 1570, already somewhat after our target era, the population density of Sweden was only about 5.2 people per square mile, while that of Finland in 1550 was a mere 2.3 people per square mile. At 300,000 people in an area of 130,666 square miles, you're looking at 60,000 families spread over (roughly) 4 30x40 mapsheets of 6-mile hexes. In 1150, estimates (since at that time there was certainly no census, nor a centralized state to conduct one) place the total population of Finland between 20,000 and 40,000 people, or at most 8,000 families, giving a population density of about 0.3 people per square mile, which in ACKS terms suggests a handful of class VI markets over that entire area. Which is... rough, for adventuring and supply. The rest of the Baltic isn't much better; Gdansk in the 1100s had a population somewhere between 1000 and 2000, which is a class V market. Many of the population centers currently on the Baltic map above weren't even founded until Christianization hit, and population records for pre-Christian settlements (like Forsigtuna, the pre-Christian capital of Sweden) are basically nonexistent. So... I guess there'd be room for some "creative license". On the plus side, such a setting does play very nicely with tribes as the autonomous domain unit, which would be fun. Regarding those historical population densities, remember that the people in question aren't distributed over the *whole* of Sweden, Finland, etc. Instead, people will be concentrated towards the lower latitudes and coastlines while the interior and higher latitudes are basically empty (with the exception of a sprinkling of nomadic Laps above the Arctic Circle naturally). This means that your 300K population *isn't* spread out over the entire ~130K square miles. Instead, that number is spread out over a much smaller coastal/southern region which will give you a relatively higher population density resulting in a relatively larger number of relatively larger towns, markets, and villages in that region. TL;DR - The historical population is concentrated in small regions creating higher regional population densities. Yeah, you'd end up with a lot of bare wilderness and population along the coastlines. I was more interested in the 1150 estimates, as 1550 is well into the gunpowder age. I don't think the 1150 numbers are salvageable by concentration, though. Well how about the Black Sea then? It's kind of an "edge of empire" region which would be affected by the fall of empire (Roman, Byzantine, or Ottoman) and more populous. The Black Sea is a great suggestion! Another one of those regions underrepresented in "world history as taught in the United States", hence also in the minds of gamers. Not quite. The population densities of Scandinavia throughout the medieval period are indeed consistently estimated in the 5-8 people per SqM range, In SETTLED AREAS. The figures DO NOT take into account the whole land mass. This is one reason, among many that towns and villages were so rare and slow to develop in the Scandinavian north outside of Denmark.